I've been working on my quilt. You know, that same one I've been working on for what seems like forever? Well I did a pieced back on it and I will NEVER do that again. I hated sewing all those strips together and I hated pressing all those seams open (so many seams..) and then when I sandwiched my backing, batting and top I had trouble getting the backing to be nice and flat. Then I had no idea what color thread to use in the bobbin since there are so many now on the backing. When I did the sandwiching I was about to scream and throw this thing out the window. First I taped the backing to my kitchen floor, smoothed on the batting, and then the top. I started pinning and realized it was really hard to pin without scratching up my floor. Plus about halfway through, I realized my batting wasn't smoothed enough. So I took it all out. I decided to use my cutting table so I set that up, taped and clamped the backing onto it (it's not big enough so I had to do it in a couple of sections-it was only about 6-8" too narrow so it wasn't a huge deal). I had trouble with the clamps, which seemed to be JUST exactly the size of the table when fully opened. I finally got it on all smooth, put on the batting making extra sure it was smooth, and started pinning. I was about 99.9% done when I noticed in one spot that the top was over the edge of the backing. 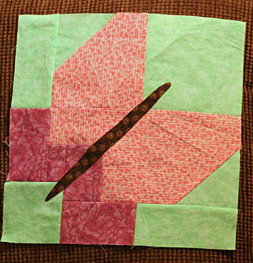 If I hadn't done a %@#@# pieced backing this wouldn't have happened-my backing wasn't a straight line at the ends so it was harder to see that the top wasn't exactly in the right place. Then I noticed that if I had only paid attention, it was obvious that the top was waaaaay over on the other end and I had a ton of extra space. It just needed to be shifted of course. So I took out all the pins again (did I mention these are SAFETY pins??) and finally did it right. My fingers were sore. That night I did some practicing with a fabric samwich and monofilament. First there was gray thread in the bobbin. I had to figure out the correct tension so the bottom thread didn't show between the stitches on the top. Guess what-the holes between the stitches look gray so it was impossible to tell. So I switched to dark blue. Not much better, actually. Finally I realized that a dark color was just a bad idea all around so I used pink. Much easier-figured out the tension. Today I did some of the quilting. Let's just say I need a lot more practice stitching in the ditch. But the monofilament is clear so it didn't show a whole lot. I did all of the longer seams so tomorrow (which is actually today since it's so late) I will do the across seams. That will be the real test of my patience-to see how many puckers I get going cross-wise. I'll try to post a picture of the backing tomorrow but I don't want to post the front until it's all done. Once I get the quilting done I need to put on the binding. I also want to free-motion quilt in the borders so I'm sure that'll be a trial. Nothing has been happening lately. My headaches are back-they seemed to get better when I got new glasses but now I've had one for a few days again so apparently that wasn't the whole problem. I guess it's time to call the doctor. ugh. So as a result I haven't been doing any crafts or anything. I have been shopping still though. Seems nothing can stop that. I ordered some crocs for all 3 kids (disney for Sammy and Jenny and plain for Jake-he wants to use jibbitz in his). If you need crocs or any other shoes Shoebuy.com has coupons right now. $10 off 1 pair or $20 off 2 pairs. If you're new to shoebuy you also get a 10% additional discount. The codes are: 1 pair of shoes use 1springfl07 = 10.00 off and for 2 pair of shoes use 2springfl07 = 20.00 off. I ordered Jenny's yesterday afternoon and within 4 hours I had a ship notice. They're due to arrive tomorrow. They are the same as mine (even the same size) so we'll have to mark them somehow to keep them straight. Otherwise she might accidentally wear mine and then they'll be trashed. She's hard on everything. I posted a while back, in my old blog, about the dishwasher we got. I hated it. Not only did it do a crappy job of cleaning, it took two and a half hours to clean crappily. After I complained every single night about it (sorry couldn't help it) Steve told me to pick out a different one and we would return the first one. There was one in the Sears ad that looked promising so I went in to check it out. They didn't have one in stock or on display but they could still tell me about it right? Wrong. They knew nothing about it. It wasn't online either. So the salesman said he would find out and call me. He did call but still didn't know anything. He had called all of his resources and no one knew about this dishwasher. It was in the Sunday AD for God's sake. Shouldn't SOMEONE know something? He kept at it though, and finally got some information for me (after over a week-good thing it was still on sale). It sounded like it had all the features I wanted so we ordered it. It was in yesterday so we took the old one back and picked up the new. It's getting hooked up right now as I type so I'm looking forward to trying it out. I have dishes that have sat since Monday night. Go ahead and call me a spoiled brat. It won't hurt my feelings-I swear. Because it's true. I haven't made any crafts to post lately. I'm still working on the pieced backing of the quilt I'm making and I haven't even looked at the new block of the month I'm supposed to be doing. I did make apple pie though. The other day Jake decided it's been too long since we had apple pie. So I asked Steve to pick up some apples when he was at the store (getting milk) and he did. We're avoiding trans fats so I quit using store bought pie crusts. I don't like going to the trouble of rolling them out either, because I'm lazy that way. So I use this recipe for a press-in-place pie crust. It's actually pretty tasty. Put everything in the pie pan. Mix with a fork as much as possible, then finish mixing with your hands. I don't like touching stuff like that so I use a plastic glove on my hand. Pull off pieces of the dough and press them to the sides first. Once all the sides are done, press onto the bottom. Once it's all evenly coated with pie dough you're ready to add the filling. It's not the prettiest pie crust in the world but hey, I'm not entering any contests and it all eats the same. When I make a fruit pie I always use a streusel topping so I don't need to worry about a top crust. For the apple pie I just used about 4 golden delicious apples (peeled and sliced), 1/2 cup sugar, and 1 tsp cinnamon. Mix it up and put it in the crust. Then for the topping mix 1/2 cup flour and 1/2 cup brown sugar. Cut in 2 tablespoons butter (I use smart balance buttery spread) until it's all crumbly. Sprinkle evenly over the pie. Bake at 350 for about an hour. I put strips of foil around the edges before I bake, and then take them off after about the first 20 minutes. It helps keep the pie crust from getting too dark around the edges. A friend on a shopping board just had a baby. I always have a frog avatar on that board and my username is frogger there, so when I saw a cute frog sleeper at Old Navy I decided I had to get it for her. She'll get a kick out of it! So anyway I rolled up the sleeper jelly roll style and tied a ribbon around it. Then I made this box from cardstock (bazzill for the bottom, stampin up for the top) and decorated the top. The frog stamp is from the Toybox set from Stampin' Up and the sentiment is from Mini Mates (also from Stampin' Up). The background on the blue paper on the top, which is hard to see, is stamped with the background stamp from Delight in Life (also from Stampin' Up of course). I colored the frog with the Watercolor Wonder Crayons (guess who makes those) and the blue ribbon is from...Making Memories. The card is stamped with a stamp from A Little Love (SU) and colored with the Watercolor Wonder Crayons. The paisley background is a stamp from Hero Arts stamped with SU Whisper White craft ink. 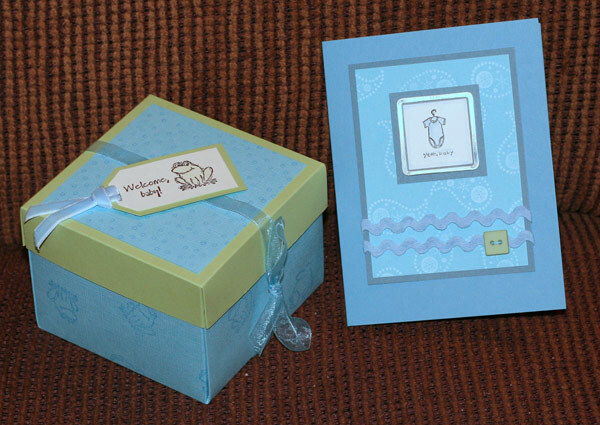 The light blue cardstock is the same bazzill cardstock I used for the box bottom. The rest is from Stampin Up. The lighter is Brocade Blue and the darker is Buckaroo Blue. The rick rack is from Doodlebug. I don't know who makes that square button. Oh the tag is from Making Memories. I got the general layout of the card from a Stampin' Up demo publication, Stampin' Success. I like the blue/green combo. click on the picture if you want to see it bigger. It'll open up in a new window-just close that window when you're done. I posted these wallhangings on my old blog but I figured maybe different people are reading this one, and I'm kinda proud of myself for actually finishing them, so I'm posting them again. If you've seen them already, ignore. Actually if you've seen them scroll way down because at the bottom of this post will be a picture of my debbie mumm blocks I've done so far. Anyway the two are both from books by Nancy Halvorsen. 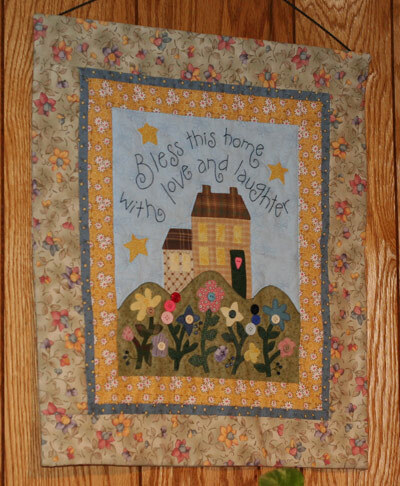 The first one is the "bless this home" wallhanging. I used the "birthing" method rather than binding it, which to me, sounds kinda gross. Plus I didn't much like it. 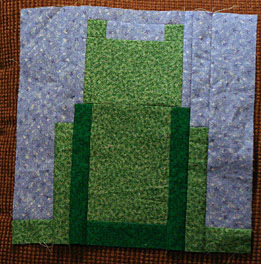 Basically you make the top like normal, then when you put on the batting and backing you do it kind of like a pillow where the right sides are together (batting on the outside), stitch all around leaving an opening to turn it, and then turn, press and hand stitch the opening closed. There's a lot less hand stitching than the regular binding method but for some reason I just prefer binding. The next one is one that I did blocks from a book, and put them together. The book is really alphabet blocks with a few angel blocks for accents and I just made the angel blocks and put in some sashing and a border. I did regular binding on this one and I like that much better. I used mostly 30's fabrics which I absolutely love. They're so cheerful and bright plus I love anything with a retro look about it. 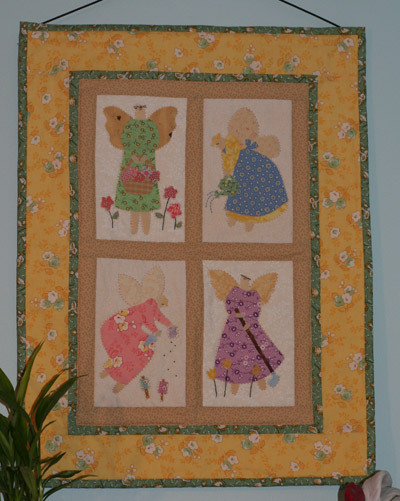 These are the January and February blocks from the Debbie Mumm Block of the Month project. I'm not doing it with all matchy matchy fabrics like she did so mine will be somewhat scrappy looking. So far I'm pretty happy with it (but after only 2 blocks it's hard to tell what I'll think later). I have yet to do the March block. I'll probably wait until the 31st of March to start on it. HA! Oh, if these blocks look like something's missing, well that's because it is. I'll do the embroidery stitches and buttons for the frog's eyes after the batting is on (or maybe after the whole thing is done). I just like doing it that way rather than stitching through the single layer of fabric. I also bought some cute Serendipity fabric (I think by P&B Textiles, not sure) and some Spring Fling fabrics by Moda. The fabrics are too cute to cut them up into little pieces so I'm going to do a simple big block lap quilt (one with each line since they don't go together) with some sashing and probably cornerstones and borders. I'll post them when I get them done. I actually have a large pieced wallhanging I'm still working on-I'm doing a pieced backing for it so when I get that done I'll post a picture of it too. We have not been watching The Amazing Race this season because, well, we hate Rob and Amber. Sorry, I know we shouldn't hate. We always tell the kids not to hate. But how can we not? They're so overexposed it's sickening. And we've been consistent; we've hated them both from the very first time we saw them (and every stinkin' time after). So when we heard that TAR was going to be an all-stars edition we hoped that Romber would not be invited. When we found out they were, we vowed not to watch the show until they were GONE. I read the spoilers online and when they came in first place 3 times in a row (FIX!!) we figured we'd end up missing most, if not all, of the season. Well tonight I read the sweetest spoiler of all-Rob and Amber are GONE GONE GONE!! I only wish we'd watched it or taped it now. It would have been nice to actually watch their misery. So starting next Sunday we'll be watching TAR once again. Hallelujah!! How cute is that dancing broccoli? Hmm he'd be cuter if he wasn't in a cage. Need to read up on how to fix that. edit: I figured out how to release the broccoli from his cage. Sort of. I made the border the same color as the background page. Ahh genius! We went to the Children's Museum today. It was a lot of fun, but it takes so long to get there, and we never get going as early as we'd like, so we don't get as much time there as we'd like. And as usual the kids fought all the way there, then while we were there Jake decided about 90% of it was 'boring and mostly for grownups'. He changed his mind after a while though-he actually had fun (imagine!). We saw the neatest movie about how glass blowers make glass shapes. They have a big display of blown glass and it's so neat. Then when they were closing in about 15 minutes we told the kids it was time to get going. Jenny was mad that they close 'too early' and she stayed mad the entire way home-almost 2 hours. Finally she said she was sorry for acting that way but it was a little late for that by then. It really makes me NOT want to go anywhere fun with them. Speaking of going anywhere, we went shopping on Friday (about an hour away from home) and Jake was a monster the entire time. Steve said next time he would keep Jake with him and the girls and I could go alone. That is something to look forward to! Anyway we went to Kohls (among many other stores) to get dancing clothes for Sammy. While there we got a shirt for Jenny. When Sammy put on her new leotard it had a little hole in the shoulder. When Jenny put on her new shirt, it had a slice down the front of it (about 1" long). It's getting really sad when you have to inspect every square inch of an article of clothing to make sure it's not holey or ripped. I doubt we'll have time to drive all the way back to return/exchange them so I guess I'll just do my best to fix them. I'm not as worried about the leotard since it's just for dance classes but Jenny's shirt is really cute and I am so not happy about a big cut right in the front of it. And this was from Kohls, which I always thought of as having good quality clothes. Maybe there's no such thing anymore. We also went to a quilt shop there. I haven't been to any quilt shop in years and years (there isn't one near us) and it was fun. It would have been more fun without the constant "are we done here yet" comments but I managed to spend a bunch of $$ on some cute cute fabric. Now I need to sew it into something.